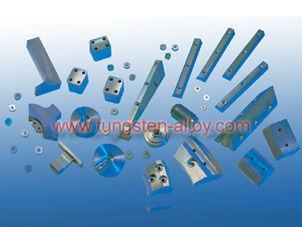 Chinatungsten Online has been offering Weights and counterbalances for vehicles, airplane, or oil well logging equipment machined from Tungsten alloy bar in blank. Tungsten Heavy Alloys (WHAs) are the best choice when designers in aerospace and defense industries require a material which combines high density, good mechanical strength and which is easily machined. The high density of WHAs makes it possible to significantly reduce the physical size of components. This in turn, gives the benefit of greater control of weight distribution and increases the sensitivity of controlling mechanisms. Where a large mass must be housed within a restricted area, WHAs are the ideal material. 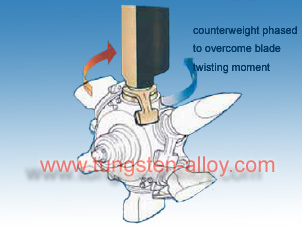 Parts made of fine Tungsten based powder by the method of sintered are therefore used as rotating inertia weights, vibration damping elements and counterweights for various applications in the automotive industry, in aerospace and sports equipment.Tungsten alloy counterweight is available both manufacturers and distributors. It resists corrosion and may feature a threaded shaft so that the weights can be positioned precisely for balancing adjustments. WHAs Counter balances are often used to optimize the performance of flight control surfaces, such as rudders, elevators and ailerons, with many advantages over conventional balance materials e.g. steel or lead. Helicopter rotor blades demand perfect balance. WHAs can be utilized to compensate for any imbalances built into individual blades during the manufacturing process, such as helicopter balance. WHAs counterweights are incorporated into the pitch control system of many propeller designs as a fail-safe device to ensure that overspeeding is prevented. 1) To adjust the center of gravity of the triangle. 2) To adjust the frequency of oscillation of the laser beams. During the last stages of assembly, weights may be required to adjust the final balance of the aircraft. WHA is the natural choice when working in a restricted space envolope, because of its high mass/size ratio. However, it can also offer the advantage of actually reducing the total trim weight mass, because higher density material can be located further from the pivot point, whilst achieving the same moment. WHA is frequently used in prototype work as ballast to simulate the weight of instruments, passengers etc. during test flights or on scale models for wind-tunnel testing. WHAs materials are frequently used for mass balancing which plays a significant role to make sure the center of gravity is precisely located, during the progress of space flight, to ensure that correct orbit entry is achieved. We are the right company who has aircraft ballast for sale. If you get any enquiry, please feel free to contact us at sales@chinatungsten.com sales@chinatungsten.com. Usually, when it comes to environmental or geotechnical studies about groundwater, mineral, oil and gas exploitation, it is necessary to well logging for analyzing stratum situation exactly when drilling boreholes. Well logging is performed at various intervals during the drilling of the well and when the total depth is drilled, which could range in depths from 300 m to 8000 m (1000 ft to 25,000 ft) or more. Since well logging always needs entering the earth as deeper as possible to get the characterization of wells, high-performance logging facility is required, and it should be heavy and firmer enough, so as to balance out much more upward resistance and enhance the downward impulse force. In fact, it should just work as counterweight for the whole part. Tungsten heavy alloy (WHA) is an excellent casing material for down-hole logging of oil wells. Casings must be sufficiently heavy to readily sink through materials such as barite mud and strong enough to withstand the hydrostatic pressure of this harsh environment. Most designs are highly machined for sensor and window positioning. Mechanical properties are very significant to the survivability of these rather large components. Owning to high density as 18.5g/cm3 max, hardness as 36 HRC max, high wear-resistance, high impact resistance and excellent durability, tungsten heavy alloy (WHA) is quite suitable material for down-hole logging of underground water, oil and gas, etc. Special mechanical property is overweight large component in this case. We can offer various tungsten heavy alloy products as counterweight for logging tools, also we would like to design the drawing or manufacture concrete products according to customer’s special requirements. The products we offered are in pressed & sintered blanks large enough to yield the desired component or machined components to customer’s specifications. What you need is the power for our progress. So if you got any enquiry or question about tungsten alloy counterweight, please do not hesitate to contact us at saels@chinatungsten.com. Price will be offered based on size, density, quantity, hardness, and any other specific requirements.